Bluehost Review - Most Reliable and Popular web hosting provider for WordPress blogs. Bluehost is the leading web hosting company when it comes to hosting a WordPress site. Bluehost is the one of few recommended web hosts for WordPress blog by WordPress.org. HostingStage.com found BlueHost best web host for hosting WordPress Blogs. Bluehost offers secure and affordable shared hosting that is best for small businesses as well as big organizations. They offer free domain, free site builders, unlimited storage and bandwidth, easy-to-use cPanel and above all 1-click install feature for WordPress. Bluehost is one of the oldest web hosting service providers which was started in 1996 by Matt Heaton. Later on, it was acquired by mega hosting company Endurance International Group in 2010. Bluehost is based in provo, Utah, USA. The company hosts over 2 million websites and blogs on their servers. Bluehost is one of the most popular and best web hosting providers in the world. Affordability, usability and scalability are the main factors that make bluehost favorite web host throughout the hosting sphere. Here is a quick Review of Bluehost. Bluehost offers different web hosting plans for all sizes and budgets like shared hosting, VPS hosting, cloud hosting, dedicated web hosting, WooCommerce Hosting, managed wordpress hosting and domain services. Shared hosting and WordPress hosting plans of bluehost are the most favorite among the customers but their VPS and cloud plans are inspiring too. Shared hosting is the perfect plan to start your website. 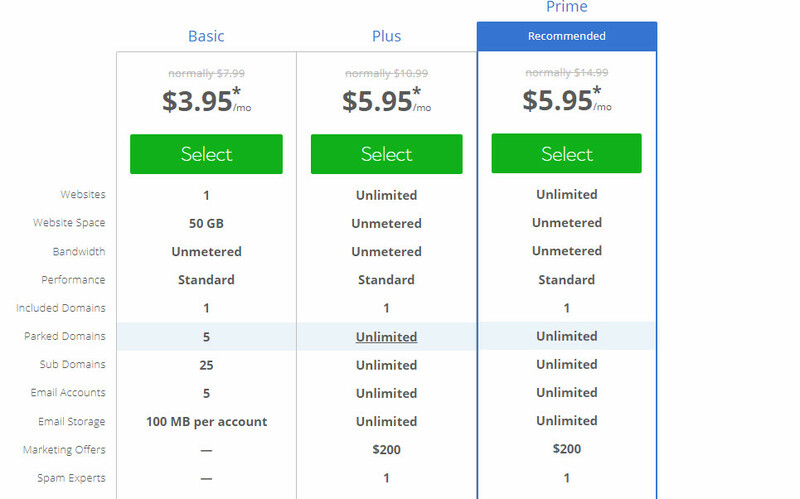 Shared hosting comes with three plans basic, plus and prime. Basic plan comes with unlimited features and you can create only one website. With plus and prime plans you can create unlimited websites and can avail unlimited features like bandwidth, storage, parked domains, sub domains and email storage. Bluehost provides quality web hosting and their prices are quite affordable. It offers different plans and packages which you can select according to your needs. No doubt, there are many cheaper web hosting choices out there but you are not guaranteed the quality that bluehost provides. Bluehost is officially recommended web host by WordPress.org to create a WordPress blog. Bluehost offers 1-click install” feature to install wordpress easily. It offers easy to use cPanel to make everything simple. Even Beginner can start their Wordpress website in less than 5 minutes. Check here BlueHost Web Hosting features and Packages for WordPress. WordPress is popular content management system and you can create almost any kind of blog or website (personal site, ecommerce site). Bluehost gives all the features and tools to start WordPress website. Bluehost provides you thousands of WordPress themes, widgets and plugins. With 1-click install feature, even beginners without coding knowledge can easily start their WordPress blog. To start WordPress blog on Bluehost, First you need to sign up for bluehost hosting account. Use this link, for the sign up of Bluehost hosting. After completing sign up process, sign in to bluehost control panel where you can easily find 1-click WordPress install feature. Uptime and load time are the other great factors you should look at while choosing a web host. Uptime and load Time are the important in ranking your site in search engines. So you should take these factors serious. Bluehost provides 99.98% uptime which is the standard in the web hosting industry. Load time of bluehost is awesome. It loads your websites in 520ms which is good as compare to other trusted web hosting providers. Bluehost servers are powered by latest technologies like PHP7, HPPT/2 and NGINC+caching for fast performance. Bluehost has modern company website which uses advance technology to handle your web hosting and make your website management easier. Like many other web hosting companies bluehost uses an enhance version of cPanel which is one of the easiest hosting panels. This standard cPanel provides user friendly interface and latest tools that make easy to manage a server and website. You can manage your domains, email accounts and all other general administration from easy to use dashboard. Another great feature of enhance cpanel is that, you can create your WordPress blog in just 1 minutes. With 1-click install” feature you can create your wordpress website without writing a line of code. Customer support is another crucial factor which differs from a hosting company to another. Some web hosting service providers are good but their response time is not that good. Bluehost provides a very good support to its customers. Bluehost has a professional support team and you can contact them easily via email, chat, telephone and tickets. Their response time is good. They are available 24*7 to solve your any problem. You can also find various video tutorials and guides to resolve common web hosting and website management issues. Bluehost offers secure web hosting for your website. It includes powerful security features like sitelock security, Advance CDN and Sitelock WAF. It is very difficult to hack websites that are hosted on bluehost. Each account is backed up on daily, weekly and monthly basis. You can easily retrieve your content and website design if something happens unwanted. You start with basic plan. If you website start getting more visitors then you will definitely need to upgrade your hosting plans. Bluehost provides an easy process to upgrade your shared account to a VPS or a dedicated server. Bluehost offers 30 days money back guarantee. So give it a try and if their services do not satisfy you just cancel and get your money back. Remember this refund policy does not apply to domain names. Bluehost has a custom domain manager that make easier the overall control of domain matters like domain transfer and tracking. All the hosting plans offer unlimited email accounts. Bluehost is one the leaders in the web hosting industry. They offer wide range of hosting plans with tons features and tools that help you to easily build your site. 99.9% uptime, affordability, scalability, lot of freebies including site builder, excellent customer support and special features to start a WordPress blog make Bluehost the no#1 web host in the industy.HostingStage.com Expert team strongly recommends Bluehost for your personal or business website. Was this article helpful? did you enjoy it? Are you going to select bluehost for your next online project or thinking other way around? let us know in the comment box. Like hostingstage Facebook page and get more helpful web hosting reviews. Some of the web hosting services listed on hostingstage.com contain affiliate links. This helps ups to cover the expenses of testing and analyzing each web host. Thank for your support.